A tour bus idles on Spring Street in Princeton, taking up a few parking spaces, on a Sunday in July. Town officials have begun implementing new regulations for tour buses that visit Princeton. In recent months, the number of tour buses visiting Princeton has increased. 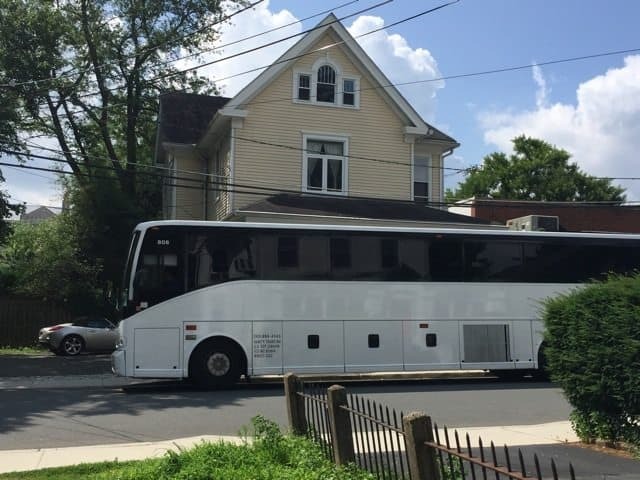 The buses often block visibility on Nassau Street, idle on side streets and in residential neighborhoods, or drive around town until it is time to pick up visitors after their tours of Princeton University. Loading and unloading of bus passengers must be done at the bus stop on Nassau Street at Palmer Square East. The designated area for motor coach parking is on Alexander Street across from the Princeton Station Parking area. If you see a bus that is loading or unloading illegally, or is parked illegally, you can call the Police Department at 609-921-2100, ext. 1, to report them to the dispatcher. why does Princeton University not offer parking since they are visiting the University?